Part two in our three-part series on analyzing the performance of pump networks discusses energy efficiency measures and presents a new way to account for variation in pump efficiency. Other topics in this issue include liquid-liquid extraction in pilot plants; Global Outlook: Hungary; and dimensional analysis and educated guessing. Donald Glatz, Brendan Cross, Thomas D. Lightfoot, P.E. When designing a liquid-liquid extraction column, pilot plant testing generates the data necessary for accurate scaleup to the production rate. This article describes how to optimize pilot plant testing. 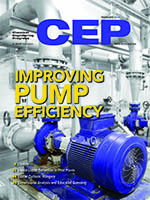 Best energy efficiency practices can reduce pump operating costs significantly. This article reviews the basics and presents a new way to account for variation in pump efficiency. Restructuring and investment underpin export growth in Hungary’s chemical industry. With continued investment in research and development projects, the country is on track to become a net exporter of chemical products. Use dimensional analysis and educated guessing to simplify experimentation and simulation, gain physical insight from empirical relationships, and extrapolate data.